Stamped concrete, also referred to as imprinted concrete, textured or embossed concrete, is concrete that has been made to look like another material such as rock, tile, slate flagstone, brick or wood. Stamped concrete has been around for many decades and is found on driveways, pool decks, entryways, patios, courtyards, and walkways, both commercial and residential properties. The current boom in stamped concrete is due to it’s cost effectiveness, customization possibilities and long term durability with minimal maintenance. Concrete as a material is easily mixed and poured over large areas and therefor makes it an ideal choice for hard surface landscaping. It offers a perfect canvas that can be colored, molded and imprinted with a variety of custom patterns and designs. Stamped concrete can be done by experienced concrete contractors and smaller projects are even possible by the average hands on homeowner. Rollers: Textured rollers with either patterns or textures or both. Integral Color – These colors are added into wet concrete. They color the concrete throughout thereby giving the surface the desired color. Color Hardener – This coloration method, colors the surface of the concrete as well as adds a hardening effect to strengthen the surface of the slab. Various colors can be mixed and layered to create stunning original effects. Release Agent – Either in powder release form or liquid release form this material is used to help the rubber stamp mats release from the wet concrete without sticking, they can also be used to add highlight colors to the concrete. Tamper – A heavy tool used to stamp or tamp the rubber mats to create an impression in the concrete. Edge Roller – A thin roller to help fix and detail grout line squeeze from the rubber mats. Chisels – A hard chisel for imprinting grout lines and fixing stamped concrete seams. 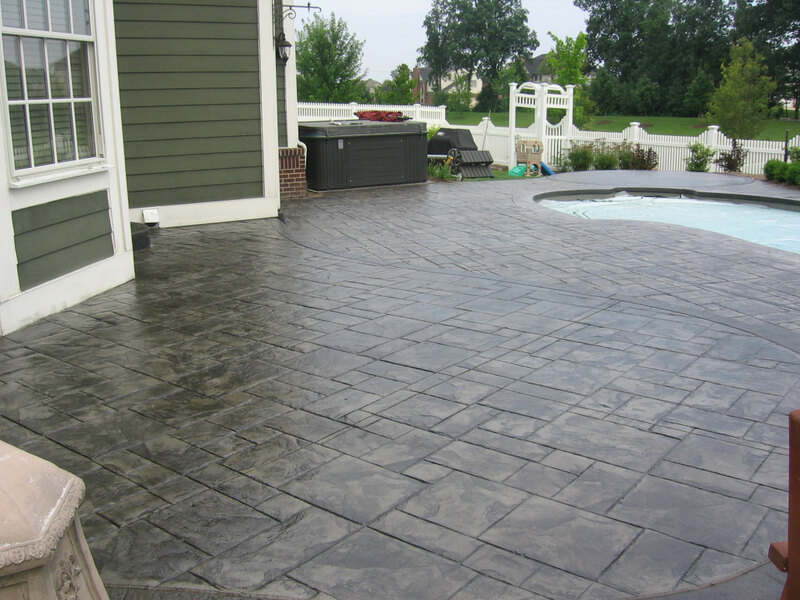 Sealers – A variety of different products designed to seal and protect stamped concrete.